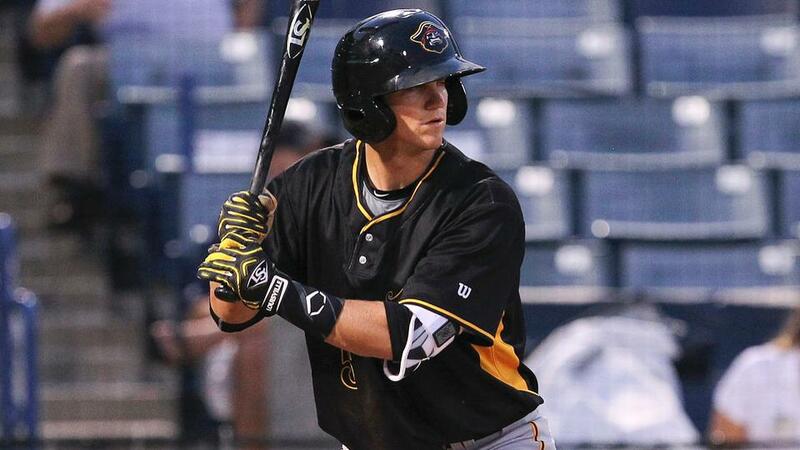 Kevin Newman is the only player to ever win consecutive batting titles in the Cape Cod League, so getting used to swinging a wood bat didn't figure to be part of his adjustment period after the Pittsburgh Pirates took him in the first round of the 2015 Draft. The shortstop struggled at the plate, though, in the short-season New York-Penn League, looking little like someone who had a .337 career average at the University of Arizona or hit .375 and then .380 in the top summer college league. There was a reason for Newman's slow start, and it had nothing to do with what he was swinging. Arizona didn't qualify for the postseason and the right-handed hitter was just rusty from the downtime. "I'd been off for a month," the Pirates' No. 11 prospect said. "If I had to do it over again, I would have tried to get in more work during that time." Newman, however, was promoted to the full-season Class A South Atlantic League despite a .226 average in 38 games when Cole Tucker -- Pittsburgh's 2014 first-round pick -- got hurt. Soon his batting average was back near normal. "It was a fresh start and I'd had some time under my belt by then," the California native said. Newman hit .306 in 23 games to close his first season, and he started this year with Bradenton of the Class A Advanced Florida State League as if he was back at Arizona or with Falmouth of the Cape Cod League. The 22-year-old had two hits on Opening Night, recorded six more multi-hit outings and went without a hit just twice in his first 15 games while posting a .379 average. The Pirates were confident that Newman had the potential to be an on-base machine when they signed him for just under $2.2 million as the No. 19 overall pick, and he has been just that so far this year. "It's always nice to get off to a nice start," he said. "I've felt good at the plate." Although it would mean playing a long way from his San Diego County home, Newman was excited to be selected by the Pirates in the Draft. "They develop their own players and value more than just a player's raw talent," he said. "They take stock in character and doing things the right way." The Pirates like Newman's makeup and baseball instincts as well as his primary skill of being able to put his bat on the ball consistently. Newman, who had six walks to five strikeouts with Bradenton through April 25, doesn't have much power, but he runs well and Pittsburgh is confident that his defense will allow him to stay at shortstop. Arizona had a good record of producing middle infielders and that helped sell Newman on the Wildcats. It also offered a connection to his future team in the Cape Cod League. "Falmouth signed me before I ever played a college game," he said. It couldn't have worked out better for either party. Newman became the first freshman to claim the batting title and then repeated his Thurman Munson Award the next year. Newman comes from a versatile athletic pedigree. His father played college tennis and his mother was a ski instructor. One of his sisters played tennis in college and another water polo. Newman credits family ping-pong matches growing up for developing his hand-eye coordination. There was no question that baseball was Newman's first love and he kept dropping other sports as he got older. "Making the Majors Leagues has always been my dream," he said. The Pirates feel confident that he'll do just that. Alford still out: Outfielder Anthony Alford, Toronto's No. 1 prospect, remained on the Dunedin disabled list after injuring his right knee on a play at the plate Opening Night against Clearwater. The Blue Jays have not divulged the exact nature of the injury, but the No. 39 player on MLB.com's Top 100 Prospects is rehabbing with the hope of avoiding surgery. Toronto assistant general manager Tony LaCava told TSN, "Right now we're taking a conservative approach, and we're just going to rehab and strengthen it and try to get him back on the field, hopefully sooner than later." Ford goes on DL: Tampa first baseman Mike Ford, who was leading the Florida State League with 14 RBIs in 10 games, landed on the disabled list after injuring his wrist April 17 at Charlotte. He was batting .371 and had two homers. Ford, 23, was signed by the New York Yankees as an undrafted free agent after playing at Princeton University. He batted .260 with six homers and 55 RBIs last season for Tampa. Powell retires: Curt Powell, who hit .322 in 80 games with Lakeland last season, retired after getting off to a slow start with the Flying Tigers this year. The second baseman was 4-for-22 in six games when he announced his decision. Powell, 24, reached Double-A last year but was beginning his third season at Lakeland. He was taken by Detroit in the 2013 Draft out of the University of Georgia.